You want everything to be perfect for your wedding day and it's important to consider and make plans for every detail. The choice and type of music, and how it is played can make a big difference to the sense of occasion. For many couples the choice of music is a very personal one, but you may also want to please your families and reflect traditional values. Many options are possible from live music to recordings, depending on your needs and your budget. Here we present some ideas to help you in this most important of choices. Weddings are important events in our lives, and we celebrate them in a variety of ways. In many cultures weddings have a religious significance but the use of music to enhance the experience is almost universal, with many musicians and wedding bands specialising in providing live music for weddings. The key parts of most wedding services requiring music are the Processional (when the Bride enters the Church) and the Recessional (when the couple leave the Church or Hall) at the end of the service. In addition to this depending on the denomination or type of service, or its location (e.g. a Hotel rather than a Church), there may be a certain number of hymns to be sung. There are also parts of the service where it is useful to play some music to create atmosphere, e.g. for 10 or 15 minutes while people are arriving for the service, while the couple are signing the register (particularly if this happens in a corner or another room), or after the couple have left the location and may be having photos taken or the congregation are leaving the hall. Appropriate music for all these events helps to create the right atmosphere. There are pieces of music from the classical repertoire that have become so closely associated with the ceremony that just a few notes from the tunes will immediately make people think "wedding". There are many other works that can also be played at various points during the ceremony, often signifying enduring love or beauty, and frequently the happy couple will chose personal favourites which might have a particularly significance to them. The choice is very large, but here are a few traditional suggestions from the mfiles archives which you may want to consider, and within the sheet music pages you will find options to download the music in other versions and formats. Prelude No. 1 from Book 1 of the 48 by Johann Sebastian Bach - Gounod later made this into an "Ave Maria"
It is also well worth checking the wedding music pages of Vitual Sheet Music where many wedding pieces for a wide range of instruments can be downloaded online. The following is a helpful and comprehensive guide and collection from Sheet Music Plus. In addition to choosing music for the event itself, you will no doubt want to capture memories from the happy event. Many couples have photos taken or videos created. These are a good way to record highlights from your wedding and you can share them with friends and family. It is not always easy to share your wedding experience though, and increasingly couples are creating their own personalised web-site covering events before, during and after their wedding. If you or a friend has the right skills you can set up a web-site with a little effort. A number of companies also provide this service and it can be surprisingly inexpensive to arrange this. As a teenager, I was the organist for a few years at my local church (in Kennoway, Fife) and occasionally at other churches. In addition to the normal services, I played the organ for weddings. Some were quite traditional and religious in nature, while others were informal and relaxed. Some couples had no particular preference for music, and mainly I used a church hymnal and some of my own sheet music books for voluntaries and processionals. 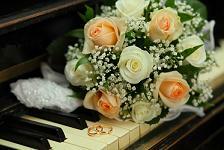 Sometimes the bride and groom would request personal favourites such as popular songs. The selections in this article are based on these experiences.